Since 2002 the sound artists Eva Pöpplein and Janko Hanushevsky have been working together as a duo, performing free improvised music and composing music for radio, film and theater. In their ars acustica-work the two are seeking new ways of working musically with field-recordings. 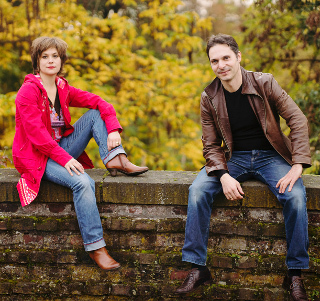 The combination of field-recordings from their abundant travels with Janko’s prepared and unprepared bassguitar, and Eva’s electronics form the duo´s characteristic sound. Commissioned works include compositions a.o. for German nationwide public radio Deutschlandfunk Kultur, Deutschlandfunk, WDR, HR, RBB, NDR, Finnish broadcaster YLE, ZDF/arte, Münchner Volkstheater, Hebbel am Ufer Theater Berlin, and Akademie Musiktheater heute. Their work has been broadcast and reviewed internationally, has been repeatedly awarded, and is included in various sound-art compilations, such as the WIRE Tapper.